Every day, patients and workers are exposed to a wide array of chemicals in hospitals and health care facilities. Many of these chemicals have been shown to have a lasting negative impact on individual health, public health, and the environment. 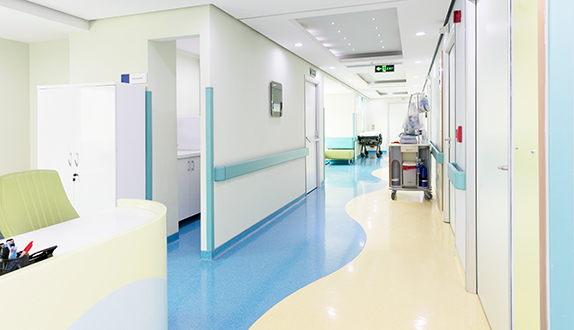 Resilient flooring is a popular choice for floor covering in health care facilities, due to its durability, ease of cleaning and routine maintenance, low cost, comfort, and the broad range of available designs. Resilient flooring manufacturers use a range of feedstock materials to make their products: from synthetic petrochemical-based polymers including vinyl, rubber, and polyolefin to natural materials such as wood and linoleum. Flooring can be an important and negative contributor to indoor air quality, depending on the materials selected. Some of the materials and chemicals used in flooring can contribute to a wide range of adverse health effects including asthma, cancer, and developmental impacts, among others. In addition, the expected volume of flooring that will be needed in the future suggests this is an important product category to prioritize in choosing safer alternatives. Health Care Without Harm has defined environmental attributes for healthy flooring in health care. For more information on how manufacturers can meet the criteria, please see the detailed guidance document. Manufacturers interested in developing a list of their products that meet the Healthy Flooring criteria should contact us at saferchemicals@hcwh.org.